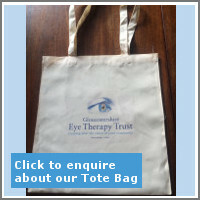 Gloucestershire Eye Therapy Trust was founded in 2003 following the merger of the two local ophthalmic charities, Cheltenham and North Cotswold Eye Therapy Trust and Gloucestershire Royal Hospital Eye Surgery Fund Charity. Our purpose is to promote and advance the study and practice of the diagnosis, treatment and care of eye diseases in Gloucestershire. We are totally funded by donations, many from grateful ophthalmic patients and are very much indebted to all those who contribute, either as Friends of the Eye Therapy Trust or by a gift or bequest. Whether you have been affected personally or supported a family or friend through eye disease - we need your continued support. The money that we raise is used to improve NHS eye services in our county. Thank you so much for your valuable support, your contributions have directly helped vision being saved or restored.